Christmas seemingly saw the start of hibernation season. 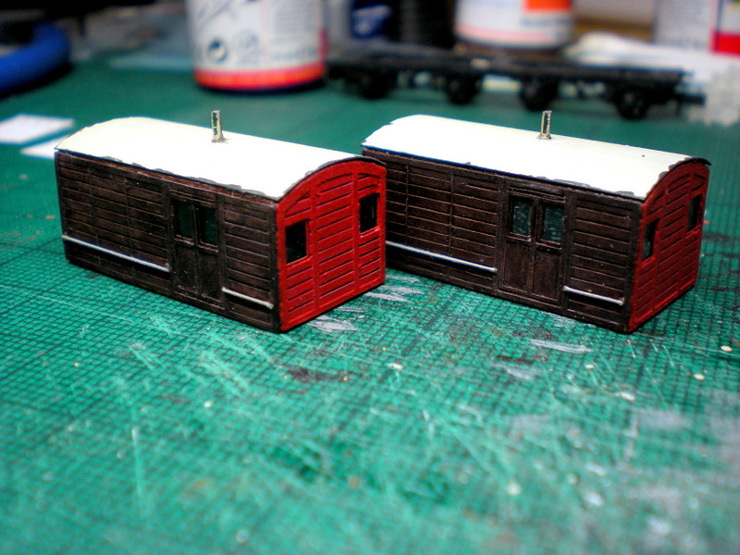 Absolutely nothing happened on the workbench for the whole of January, although it was mostly because I was stuck deep in other projects. It took a rail show in Monmouth as part of the Bridgebury Gate layout operations team to wake me up (see the link on the front page). 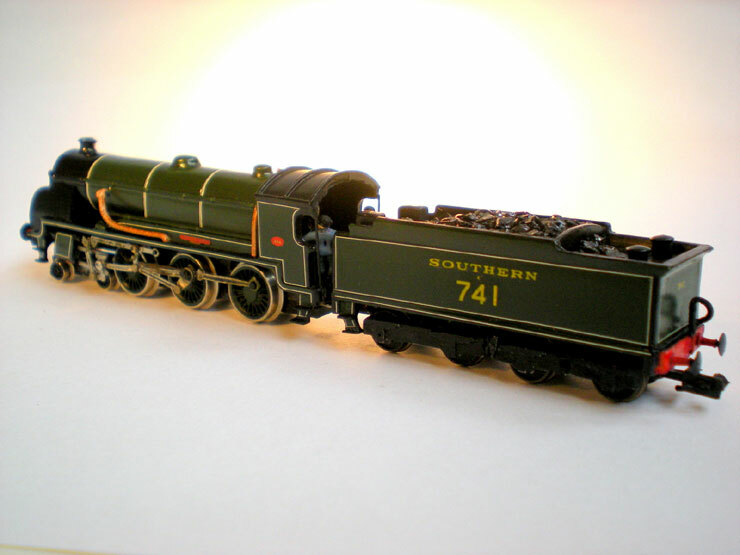 Okay, 'layout operations team' means running trains on an exhibition layout and engaging with interested members of the public, but it's good fun and it certainly reawakens your enthusiasm for toiling away at a work bench on those cold winter evenings. That was less than a week ago, though, so for now let's just catch up on the last of 2016's work. There's quite a lot of it so I'll keep the captions fairly brief. 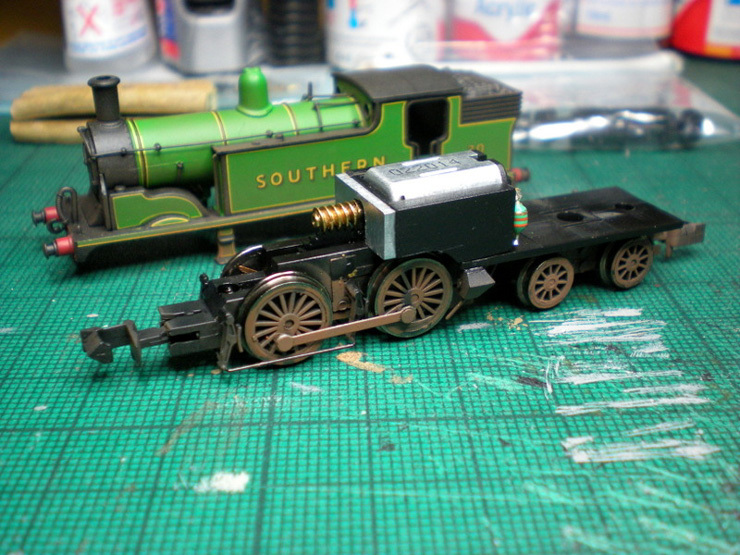 First off is the Union Mills T9 4-4-0 in Southern Railway Maunsell Green (first mentioned on the previous page). This project actually started back in summer 2016, but it took a while for there to be anything worth reporting. 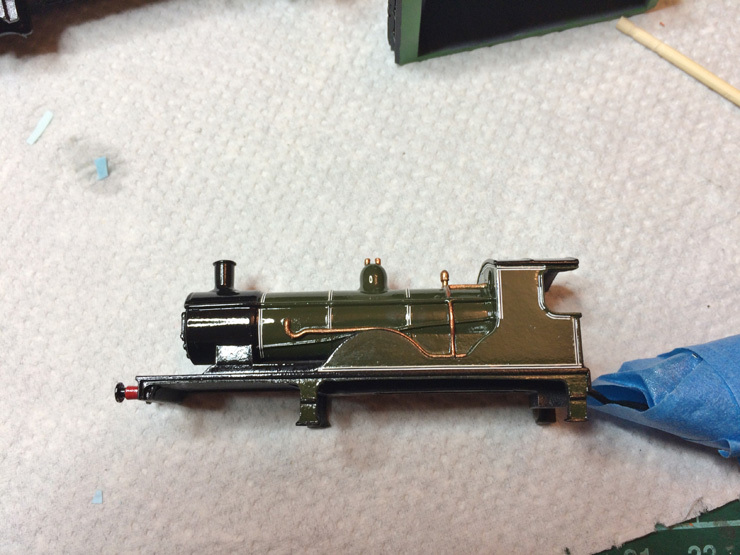 Now the pipework was painted brass, the splasher tops black, and the loco wheels green. 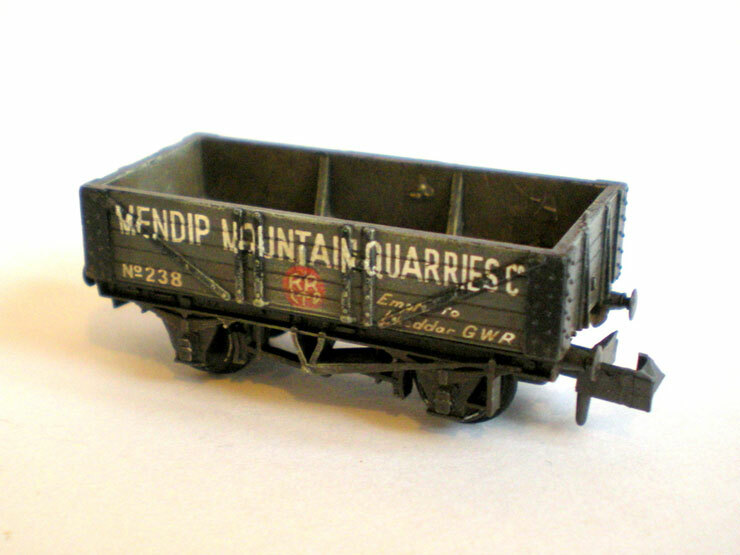 The moulded coal load was filed down at the front as far as possible without damaging the tender itself. 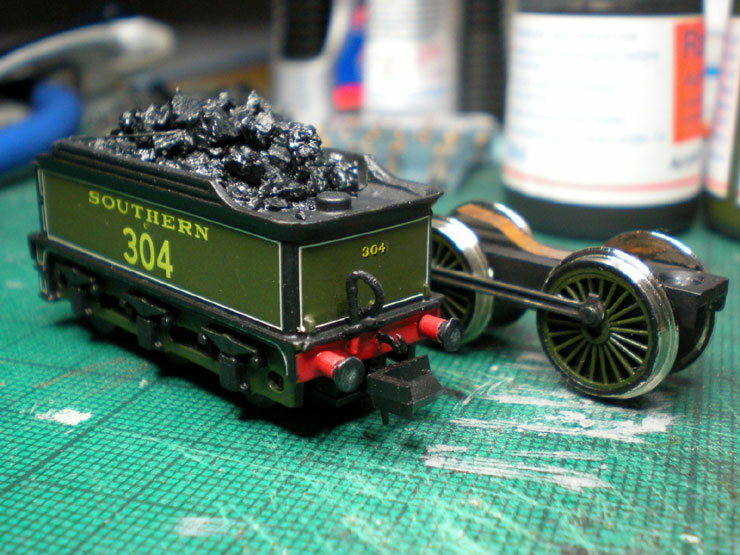 I'll add a real coal load later. 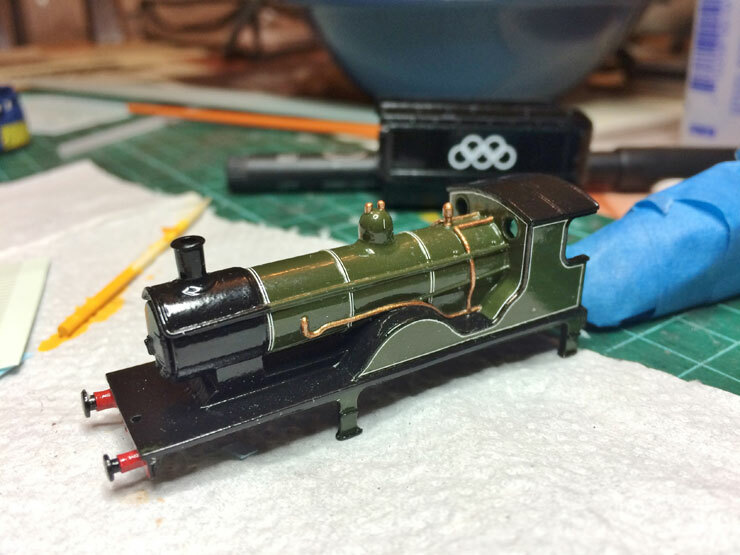 Then the loco was sent off to Ozymandias of the N Gauge Forum because there's only so much work I can process through my own workbench in one lifetime. He's doing the white lining, and over several months the next few photos show his progress. That's where we are with the T9 at the moment. 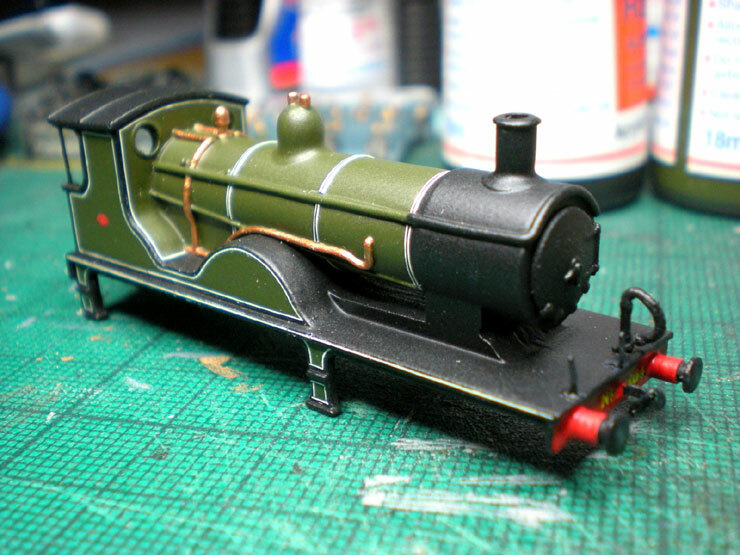 Personally I can't wait to get it back and add some extra detailing over the finished lining and paintwork. It's going to look absolutely marvellous. Joining together the two chassis so that they were a single unit didn't work. 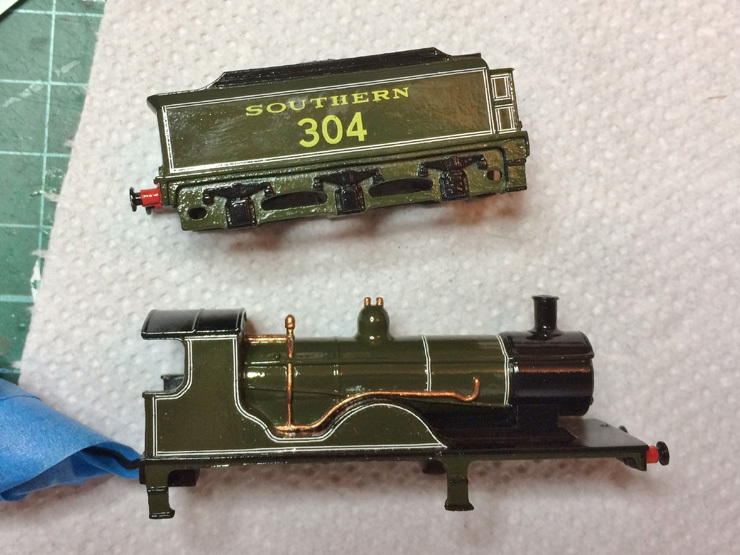 It simply derailed on a couple of the tighter curves on my layout, so I figured out a handy method of making it look as though the two chassis were secured together while allowing a touch of flexibility so that it would go round the tighter curves without derailing. Astonishingly, it worked! The corners needed a tiny bit of filler to square them off. Milliput to the rescue. 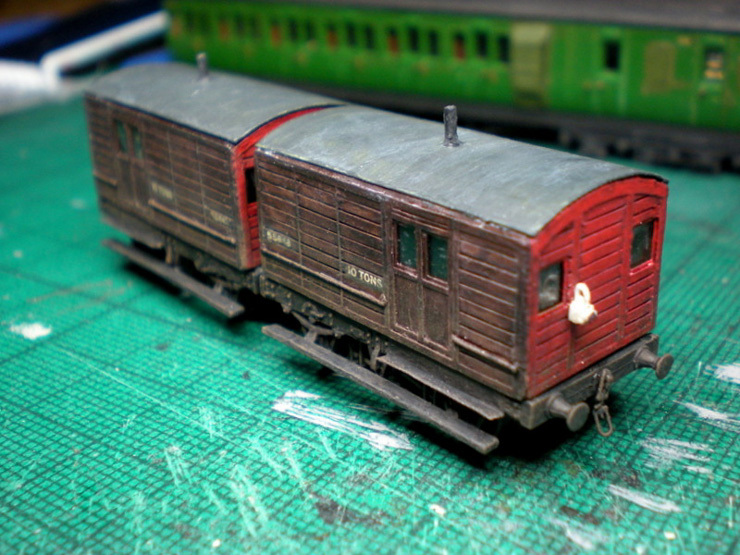 Top coat paintwork to bodies and roofs... and interiors too. 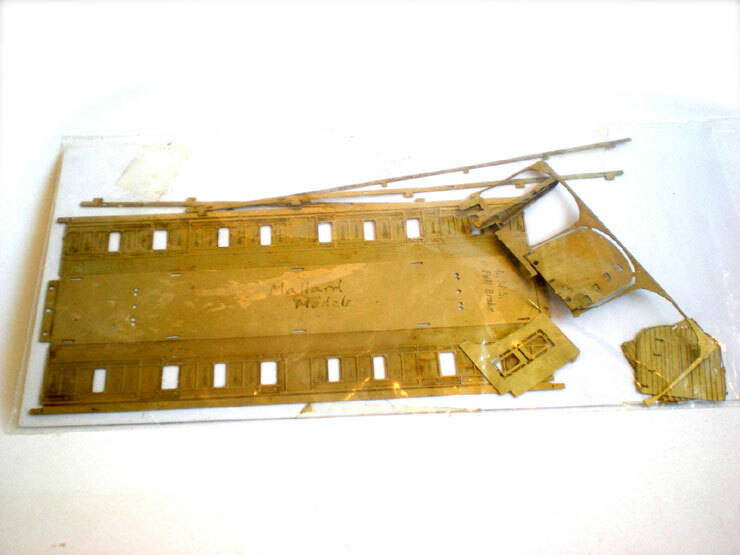 A broken pin body for chimneys (through a hole in the roof for extra solidity) and brass rod for the handrails. The glue itself adds the tapered shape to the base of the chimney and this looks very effective when painted over (see below). 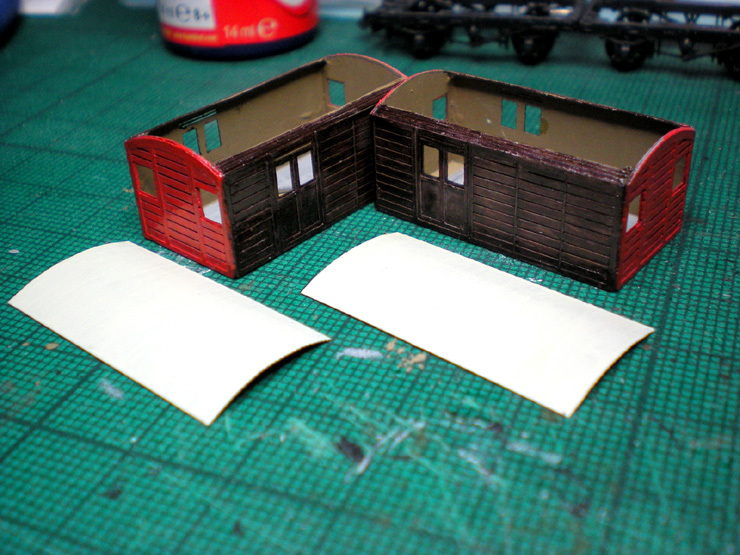 Lettering done, the bodies were added to the wagon chassis, and paper steps were added under the doors. 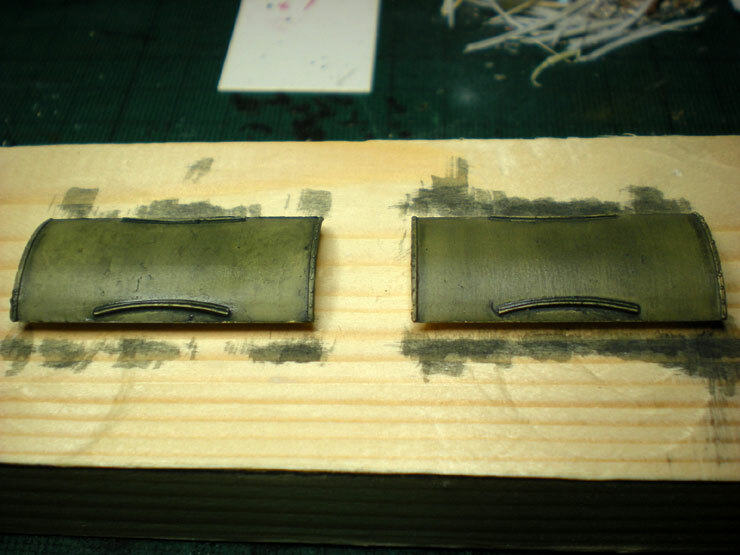 The lower running boards were made of thin card soaked in superglue. 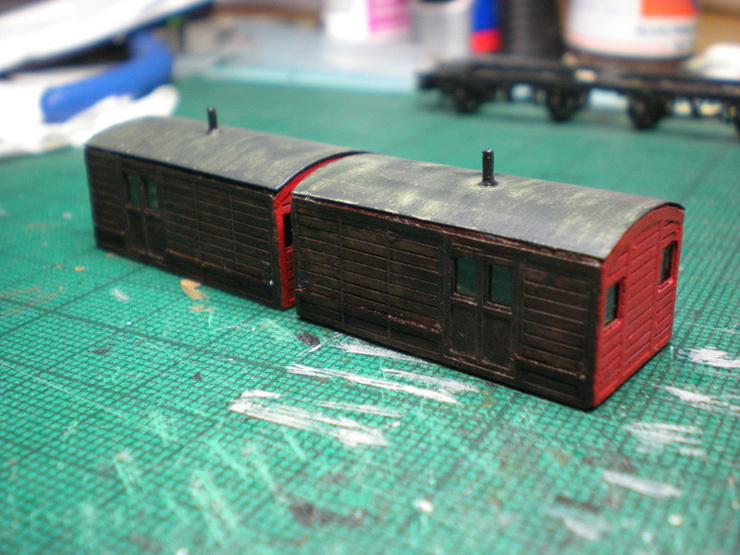 And here's the finished article, with a layer of dirt added. 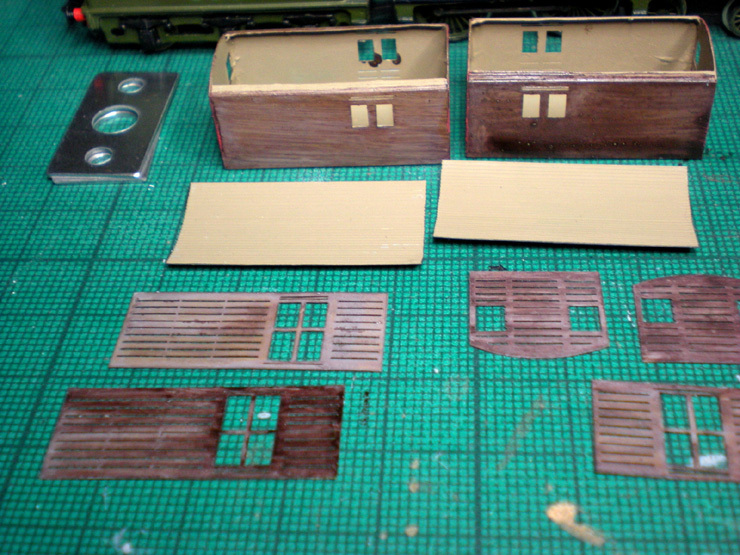 The short roofs let it down a little, but the problem areas are barely visible at normal viewing distance. 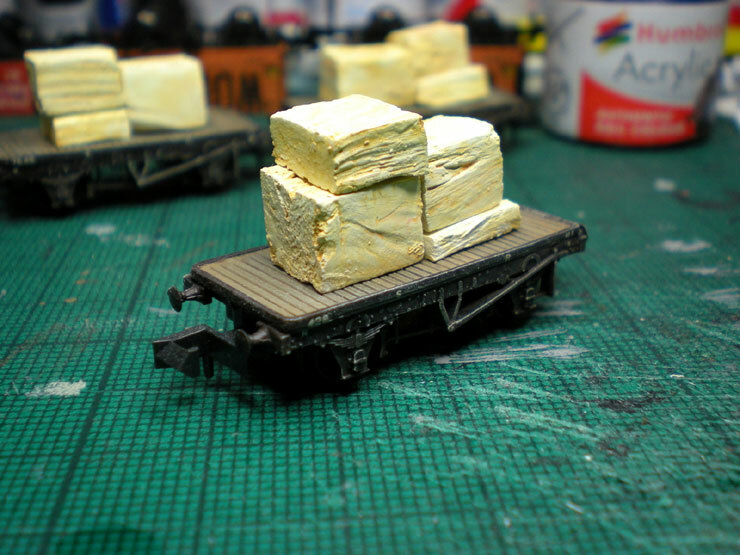 Another ongoing project is the Del Prado Class L Remembrance tank. 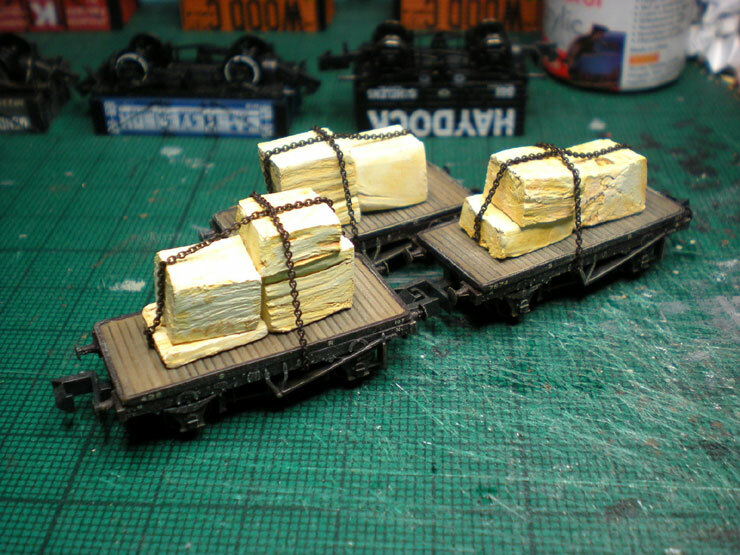 I have two N Brass Loco four-wheel front bogies, but preparing the first one, to go at the back of the motor and chassis, took quite some time to fine-tune and get working. 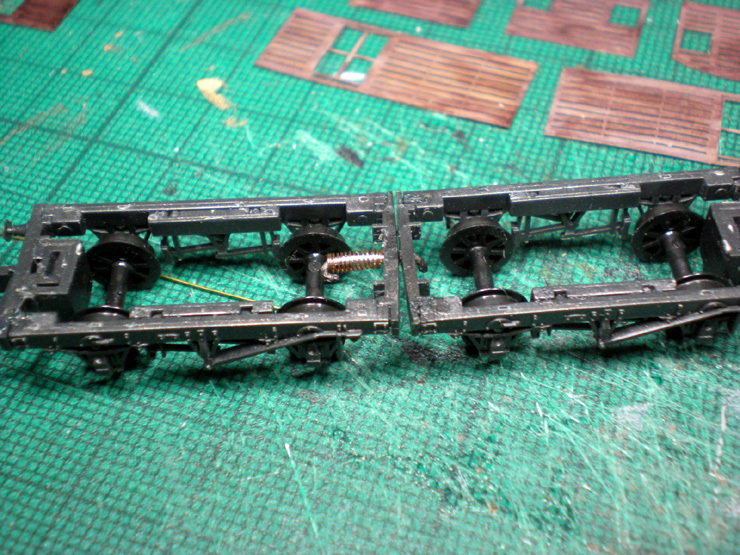 With the rear bogie now working satisfactorily, it was time for the front bogie, test-fitted here. 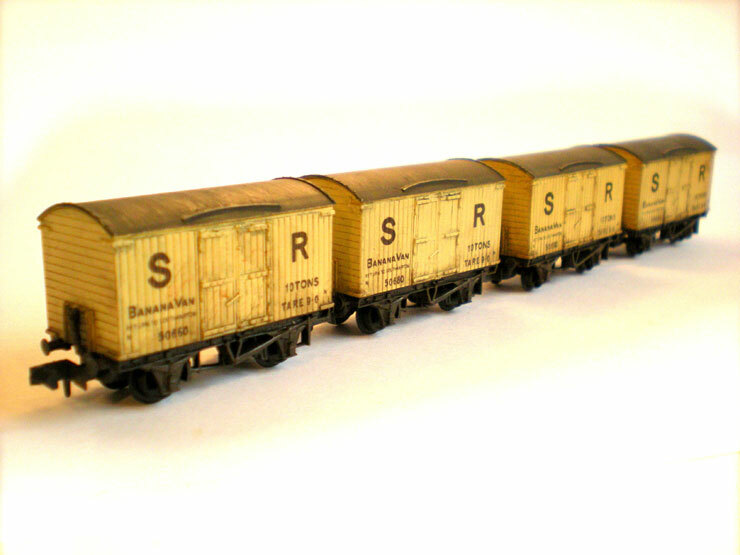 Of the batch of Gramodels resin wagon bodies (mentioned on the previous page), all of which are LSWR diagrams, I picked these three to be done as the first batch. 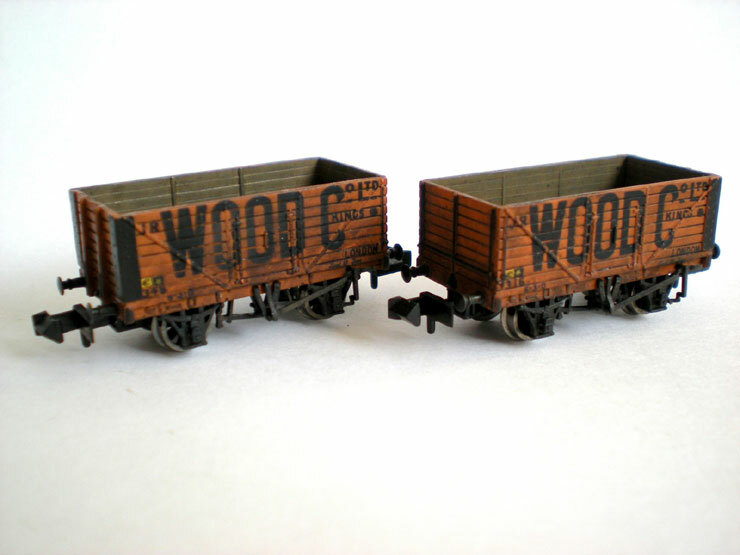 Adding them to a Peco wagon chassis is easy enough, although there's no space for the lead weight. 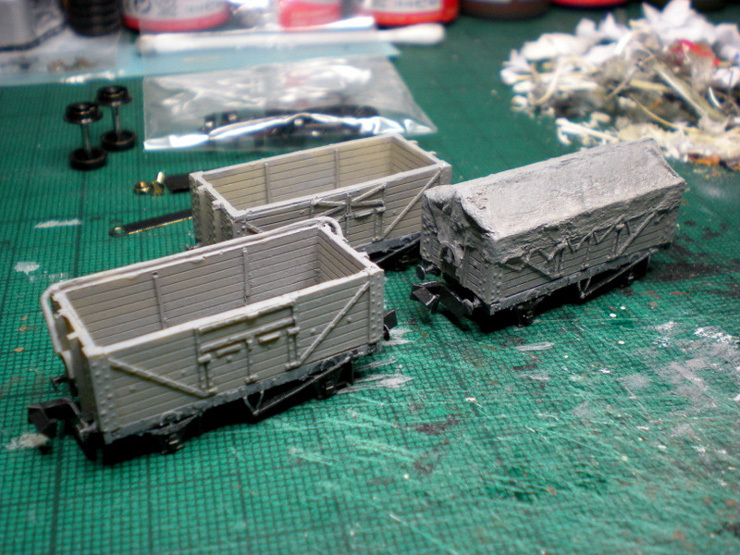 Instead, I trimmed these a bit and glued them on underneath the chassis. Painted black they don't show up at all. ...and clearing the greasy gunk off this bargain buy. 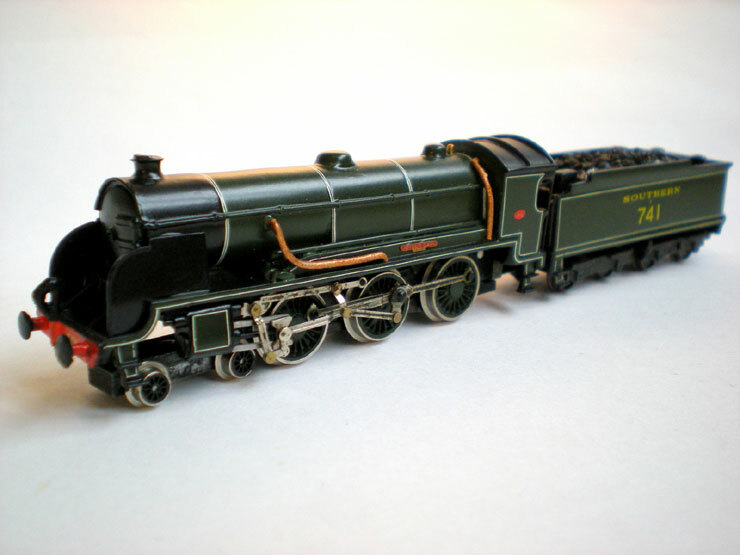 It took a while but this could be one of the better-running Dapol M7s, and would be a handy chassis for one of the old Graham Hughes 0-4-4 tank kits - if I can ever find one, that is. 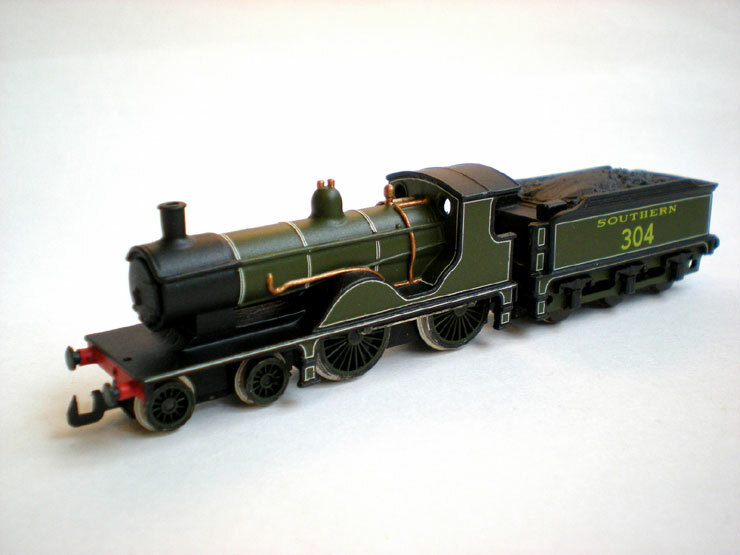 Next was my lovely Princess class 4-6-2 tank engine. 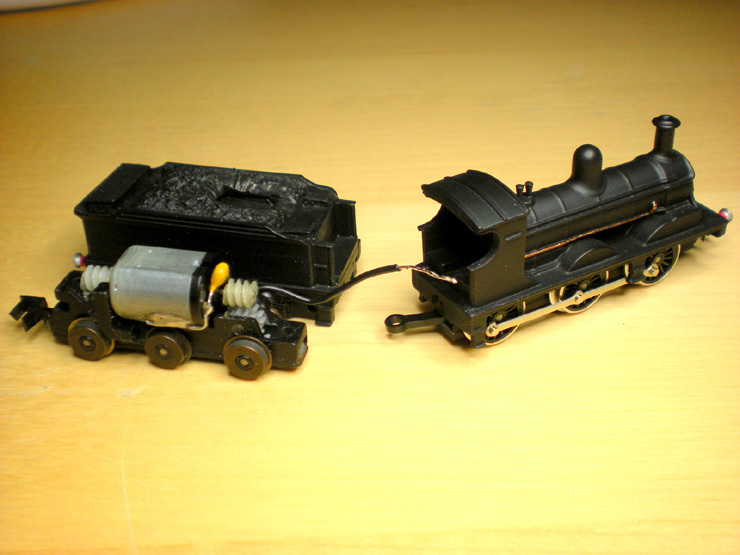 The white metal body hadn't been prepared properly, so that the tops of the wheels and the side motion that connects them was rubbing the metal and causing the loco to lurch. 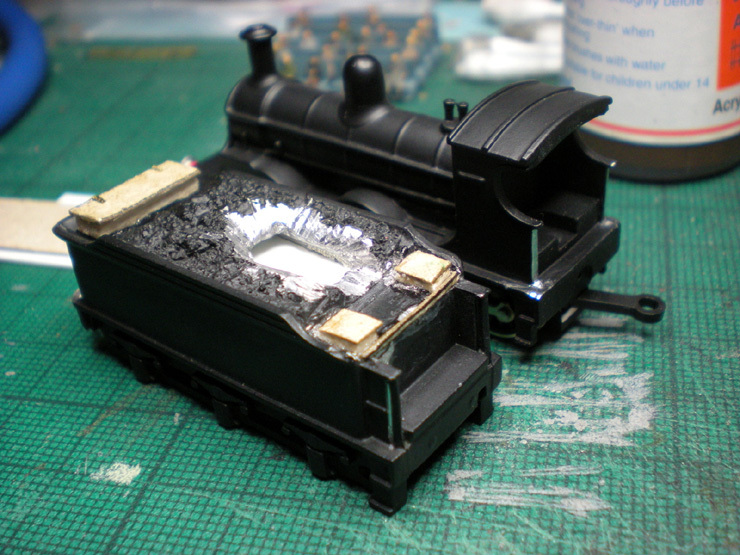 It took quite a bit of slicing and filing to get the body to sit comfortably on the chassis, and then I decided to complete the job by adding a bit of detailing - white lamps and a vacuum pipe at the front. The wheels still need to be washed and darkened. 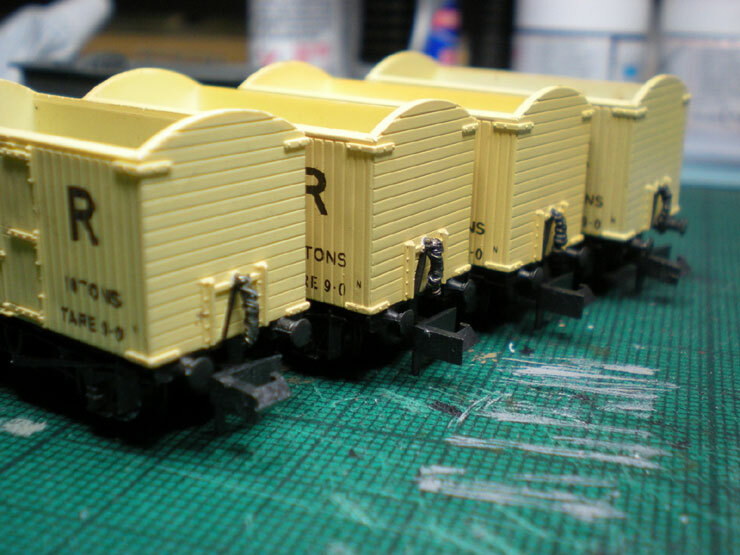 The final project before Christmas - detailing and weathering four SR banana vans. 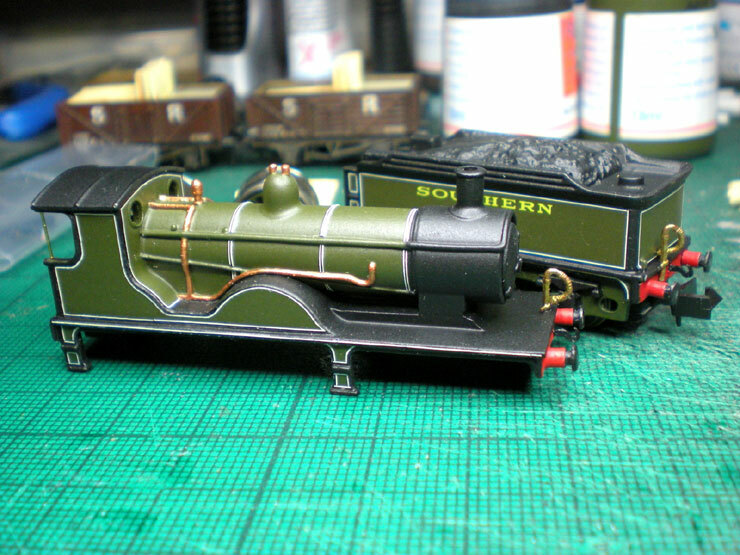 They all needed vacuum pipes fitted, which I made up with twists of bared layout wire to save the BHE vacuum pipes for my coaches. 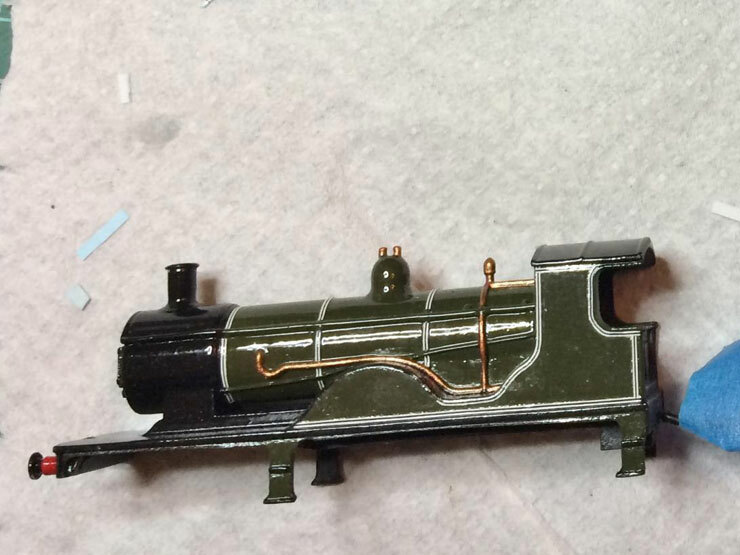 Vacuum pipes fitted and painted. The roofs received several thin washed of roof dirt until they were the right level of dirty. And then the bodies had a thick wash of dirt, much of which was wiped off with a cotton bud, leaving just the grimy bits in between the panels and near the chassis. Here's the set, with a little scratching with a knife and a tiny bit of repainting so that they are all numbered differently. That's it for 2016 and for catching up. 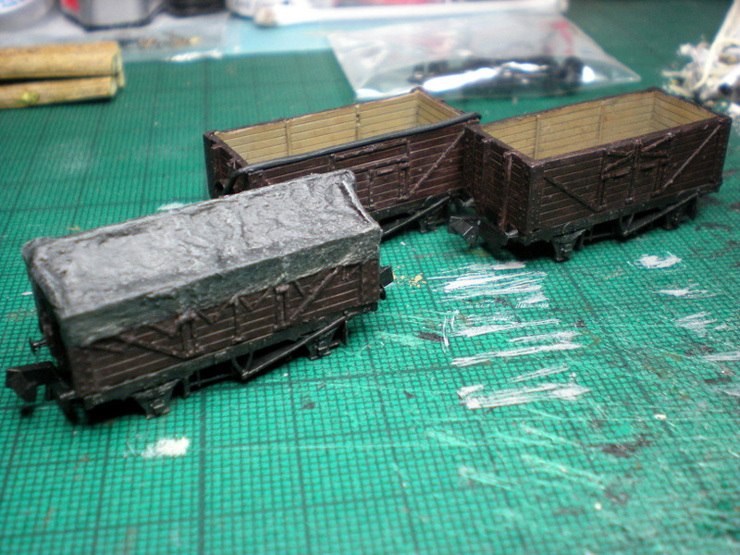 There's another wagon load project on the workbench now, but I'll get to the end of it before reporting on it. 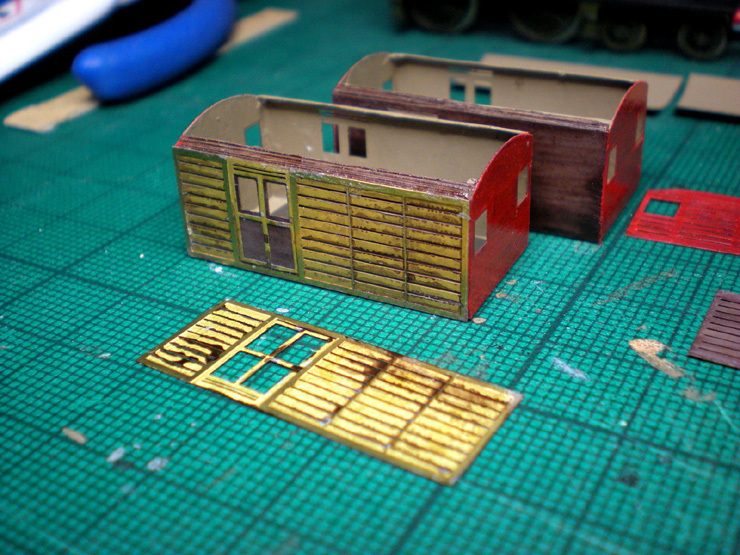 Also on the workbench is an LSWR 6-wheel etched brass coach kit from Ultima/Etched Pixels. That'll be reported on a page of its own. It still needs detailing, and that's the next step, but even like this it looks magnificent. 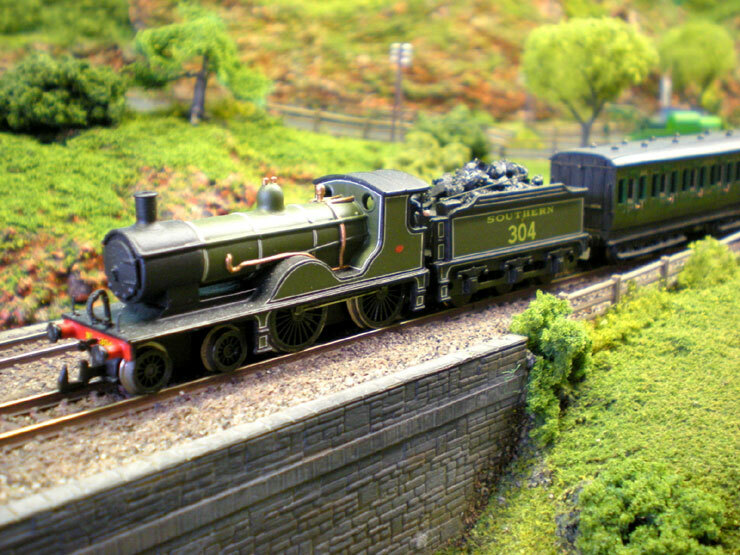 The other loco is new - a Class N15 'King Arthur' 4-6-0, built by the LSWR in 1918-19 and named Joyous Gard. I managed to win it as an eBay bargain when no one else was looking. I was the only bidder, thank goodness. 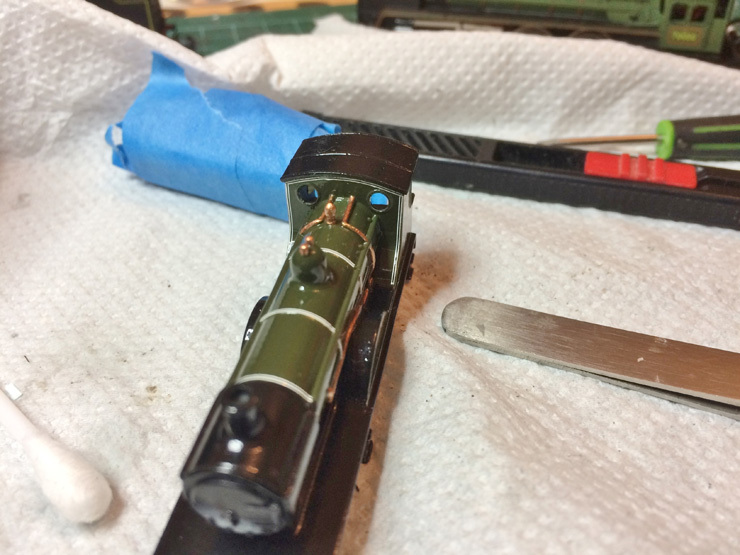 It had a few minor chips in the paintwork, a missing vacuum pipe at the rear, a couple of wonky or loose buffers, a crew painted in a vivid mid-blue, and a cab fall plate that was well past its best, but a few nights of minor surgery righted all those problems. 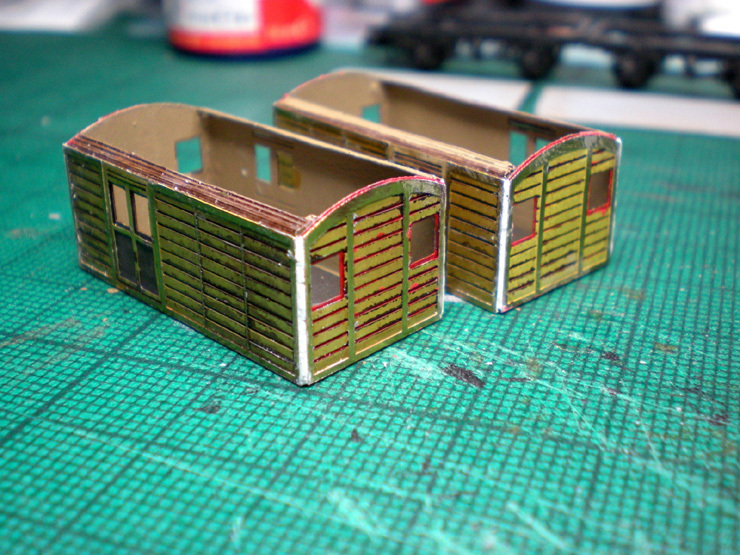 The workbench has been a busy place this spring, and so has the layout (see separate thread). 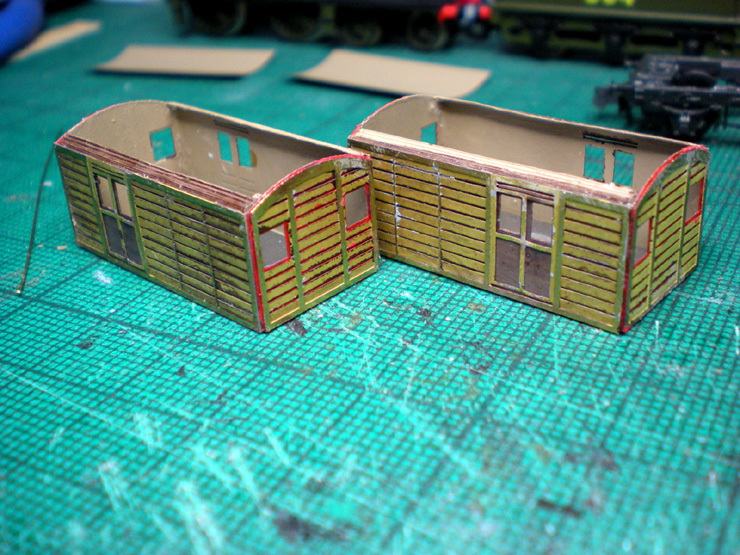 Much of the attention has been on Southern Railway locos, but some coach kit building is also ongoing and this will be covered in another thread when the work's finished. 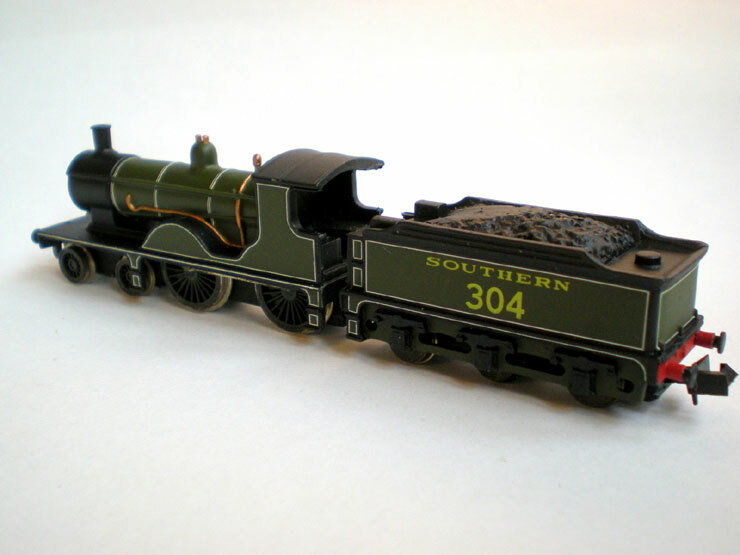 The supplied tender is fine for a Drummond T9, like the one being lined (see above), but it's not accurate for an Adams 395. The toolboxes at the front needed to be hacked and filed off. 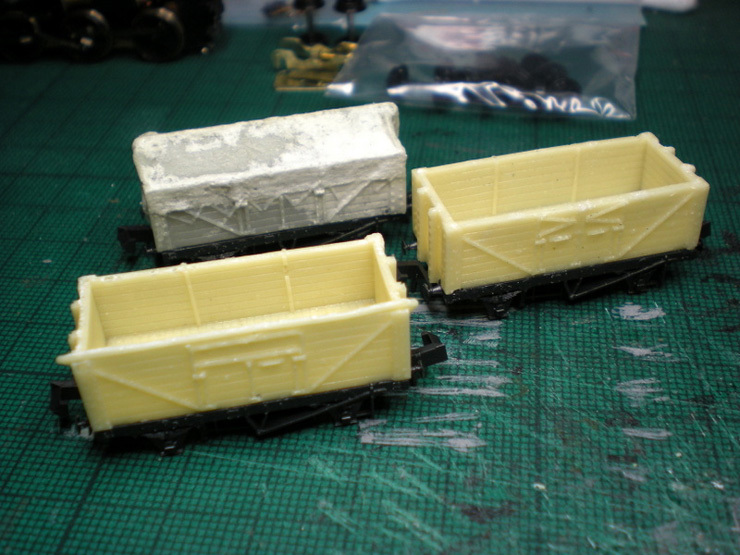 Then I opened up the moulded coal so that I could create a slightly different coal load for this one. 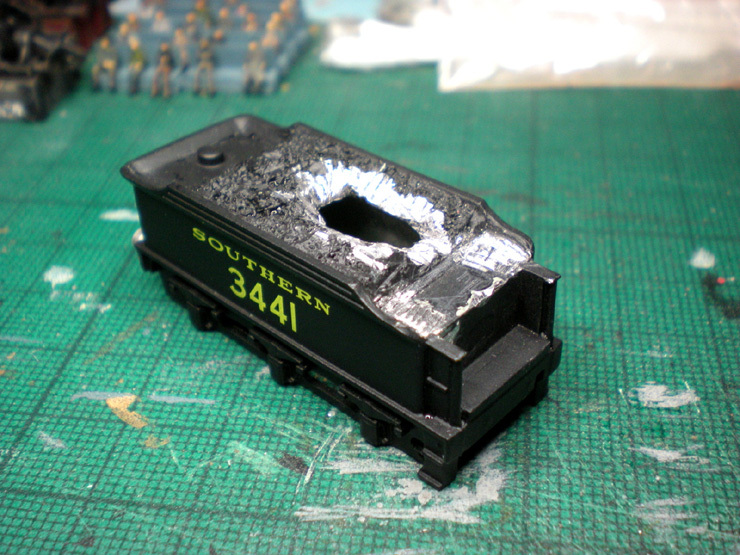 After much drilling, hacking, and filing, the coal load was opened up and a false bottom using plasticard was glued in underneath. 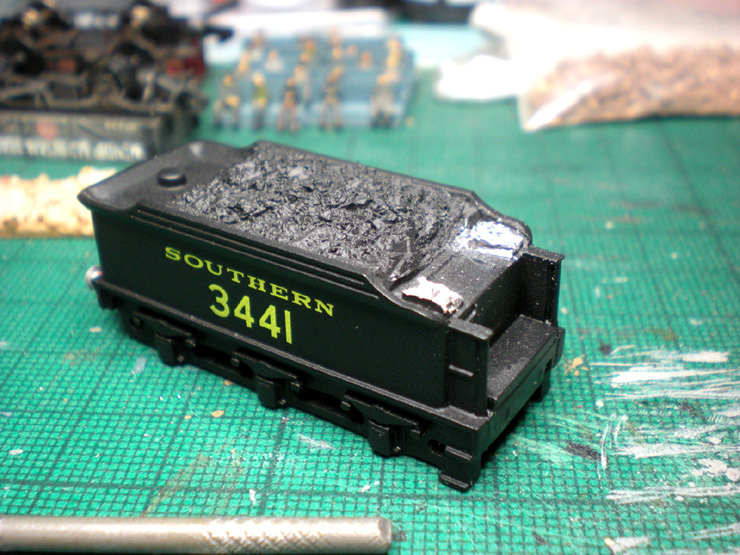 A new front ridge was added (card) because the coal load comes right up to this. 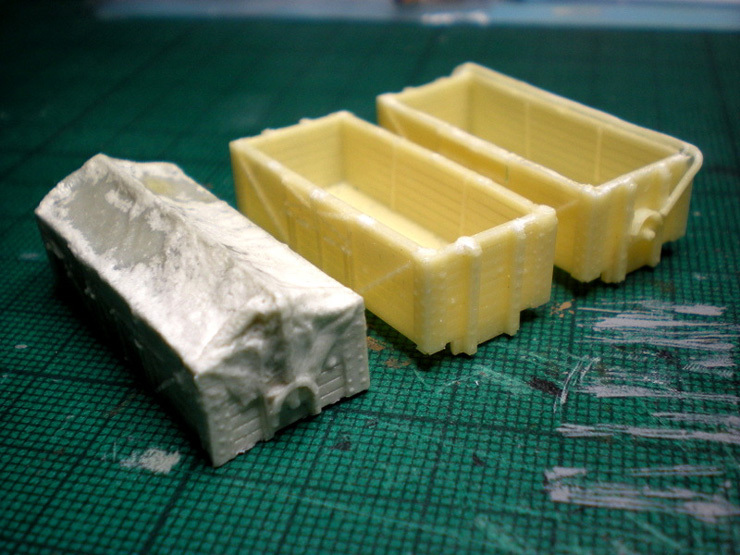 New, lower toolboxes were installed (balsa wood topped with card and coated in superglue so that they can be filed smooth). 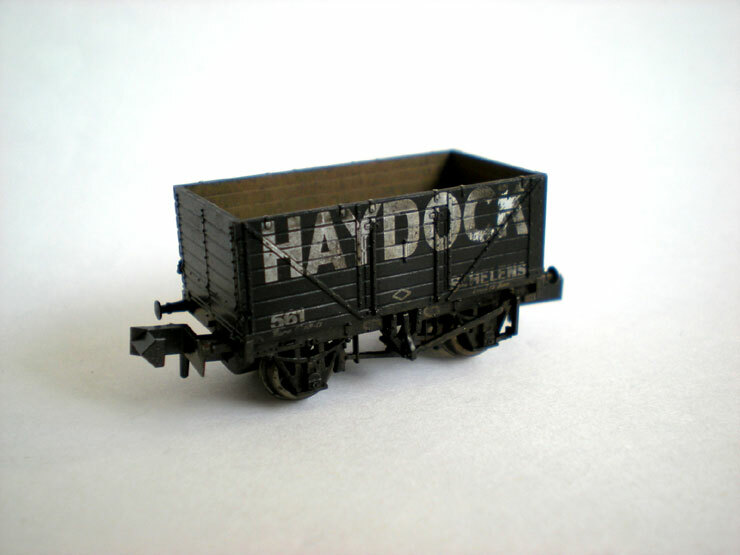 The usual, round water tank hatch at the rear of the tender (see above photo) was filed off and replaced with this rather novel 'toolbox' lid (balsa topped with card), and two bits of scrap brass were added to imitate the hinges. 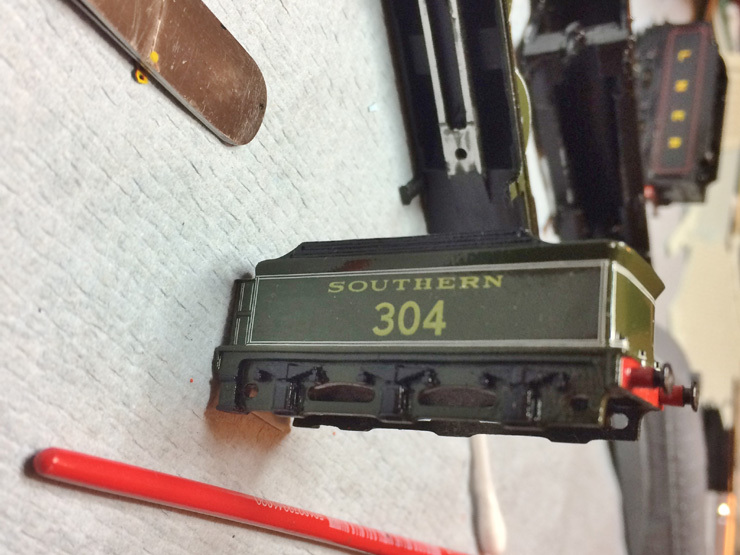 The 'SOUTHERN' lettering and the loco number have been removed from the tender sides. 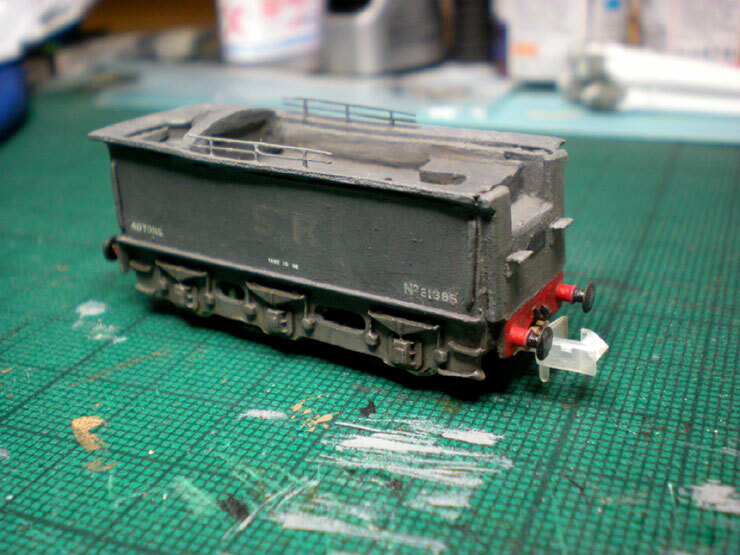 This loco will eventually be E0153, the zero being there to show that it's on the 'reserve' list of semi-retired locos. 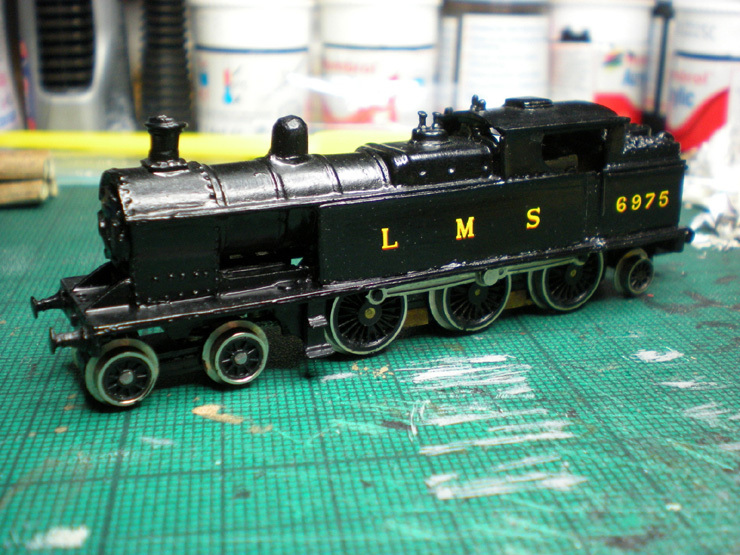 The loco has had its moulded cab handrails removed. These will be replaced by brass rod. 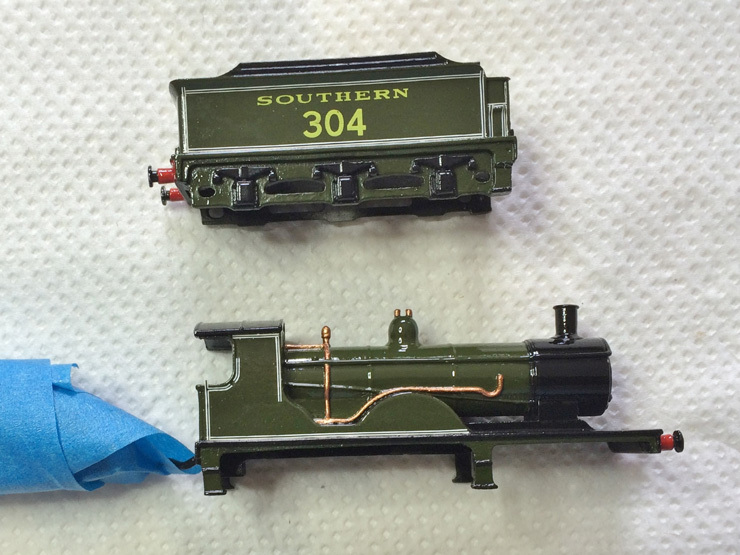 Both tender and loco have had spaces prepared for vacuum brakes and hooks. 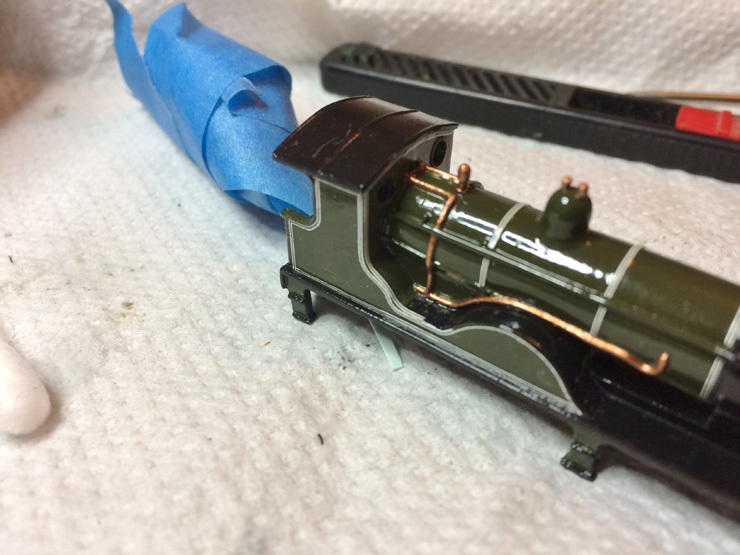 Once undercoated and washed several times in watery black, the tender is now ready for its green lining, which I'll allow an expert to do while I get on with hacking other things. 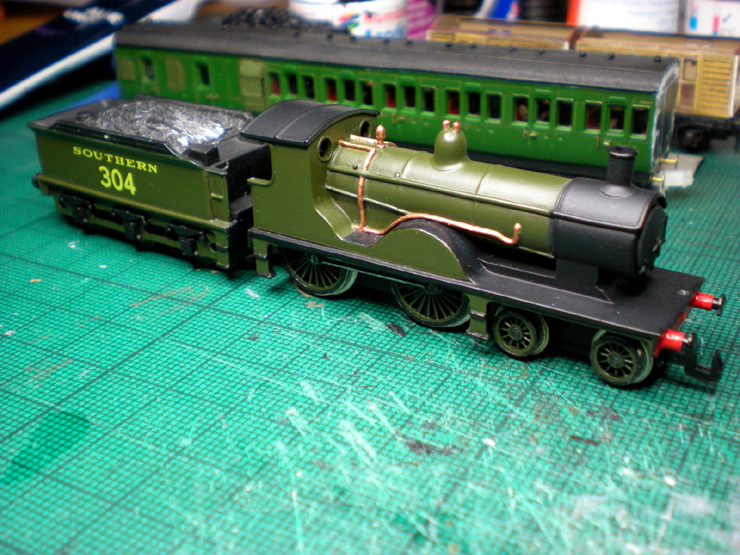 You can see here that the copper pipes on the loco have actually been painted copper now (they come supplied in black). 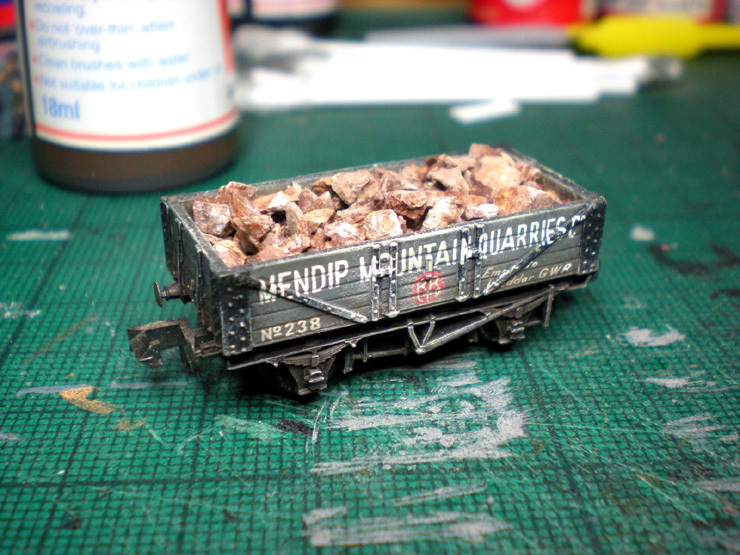 With that done, another project was to create a mineral load for this wagon. In the end I simply used refuse from my house - literally. The outside of the house is pebble-dashed. 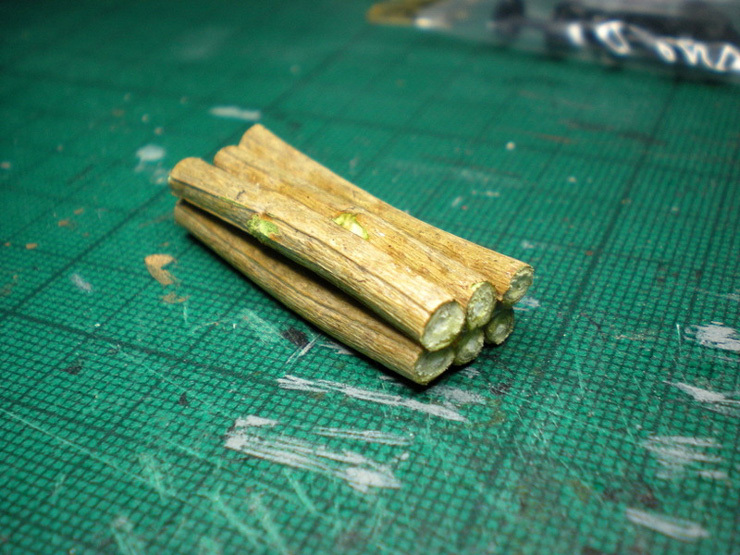 Whenever I do any work on the house bits of it flake off, so I save them for just this sort of use. 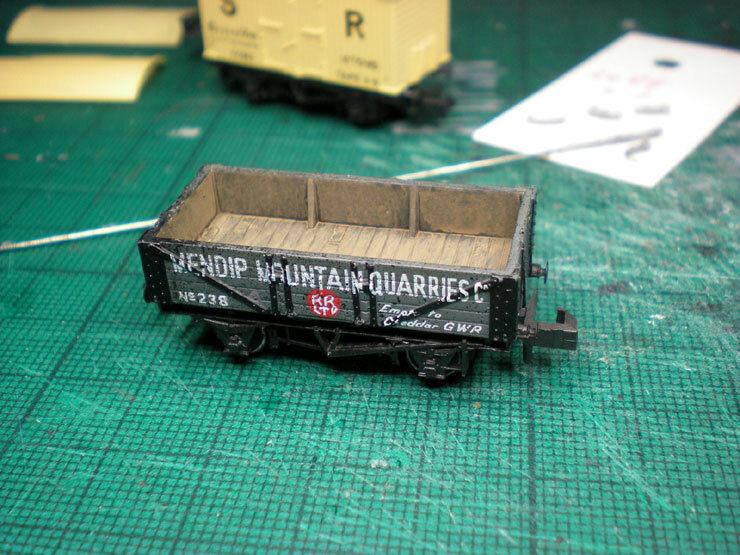 I could do with three or four more Mendip wagons to make up a mineral train. 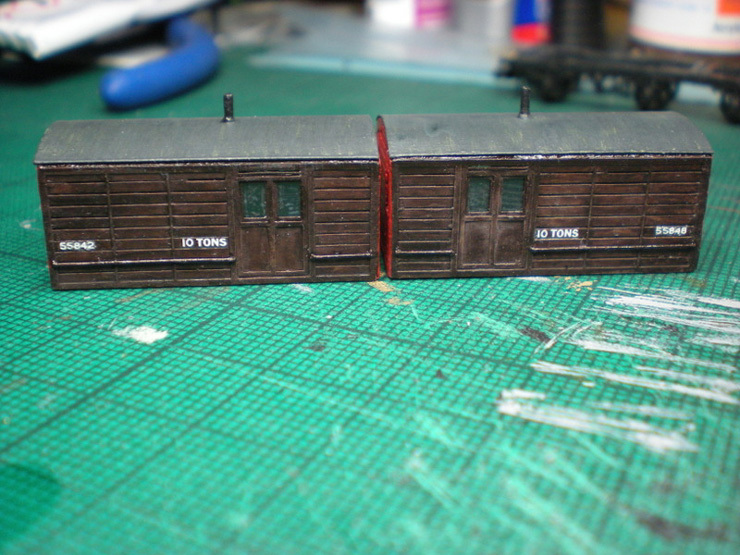 Now for detailing the T9 after its adventure in the lining shops. 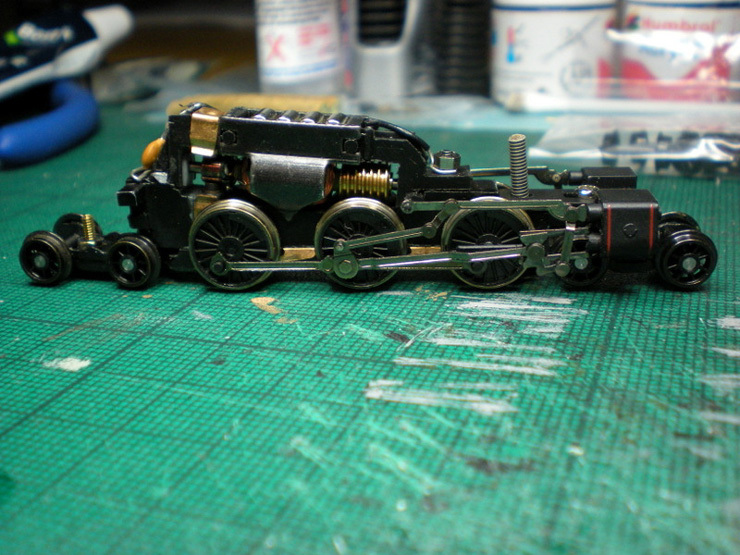 Vacuum pipe added to loco front and tender rear. 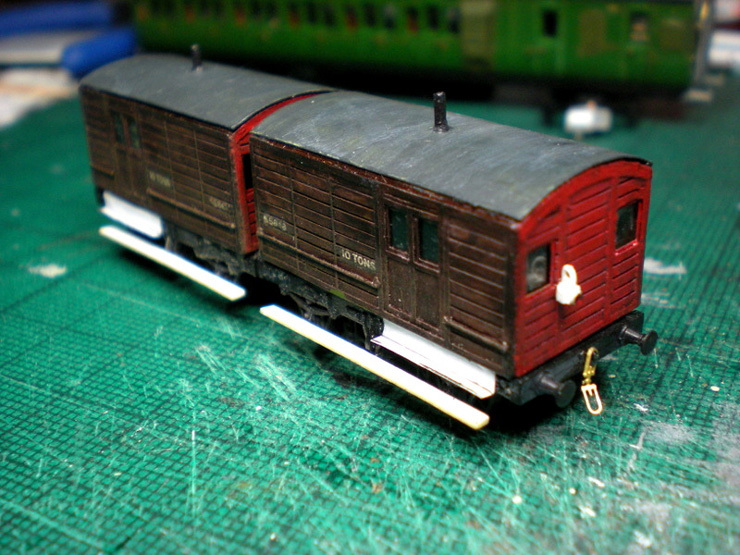 Handrails added to the cab. 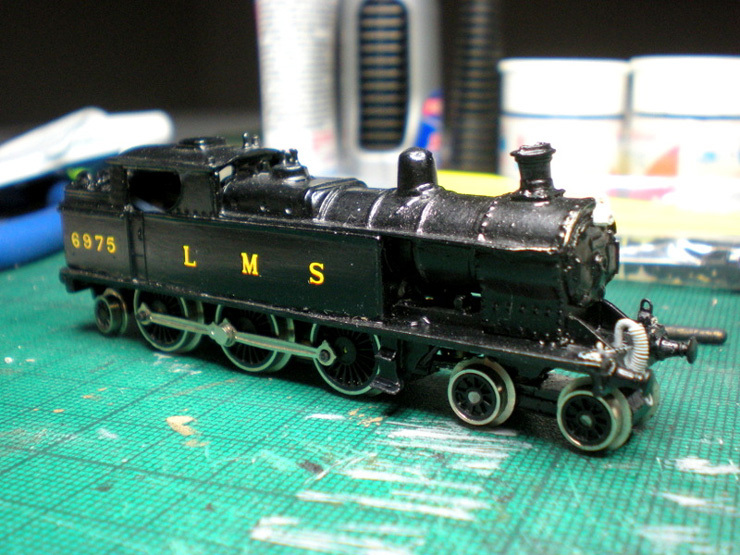 Then lamp brackets were added to the front of the loco, and those and the vacuum pipe were painted and varnished. 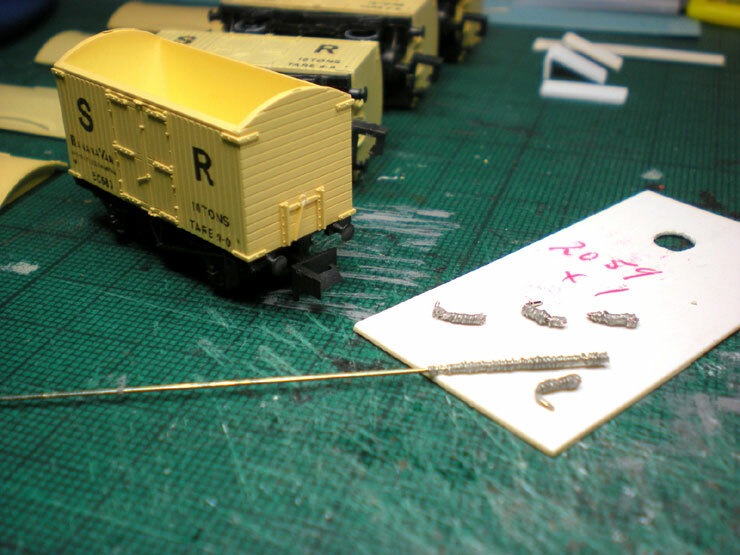 A coupling hook and chain and also the loco number were added to the front of the buffer beam. The beam itself had already been repainted, along with the buffers. On the sides of the cab you can see the red oval plaque that carries the loco number and company name... or it would if I could paint that small. The bonus is that no one can tell without a magnifying glass. 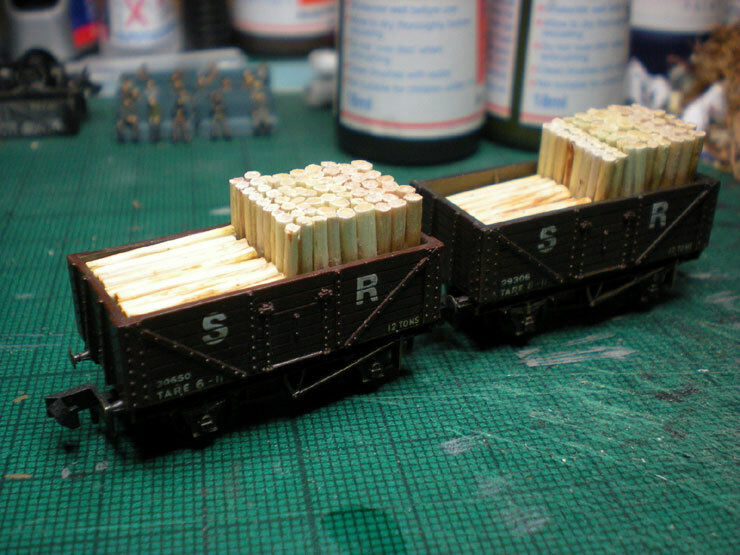 A fresh coal load and fireman's tools were added to the tender, along with the loco number at the back of the tender and the 'E' number prefix on the sides. 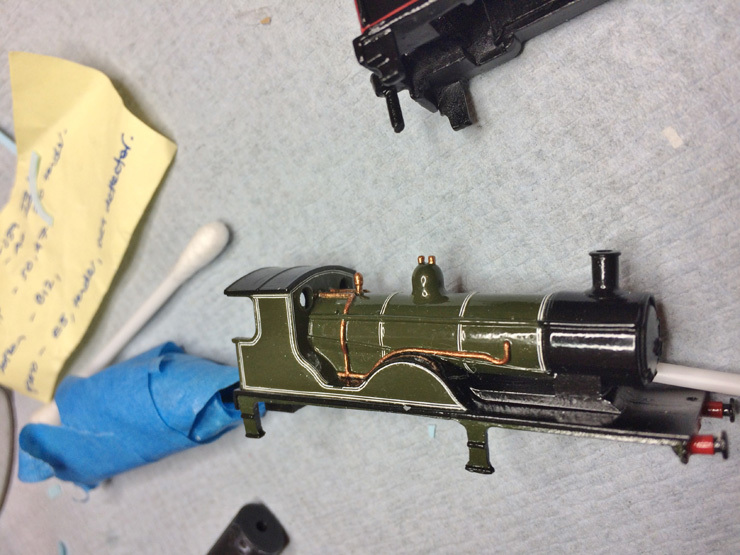 The vacuum pipe was painted and the hook was also added. 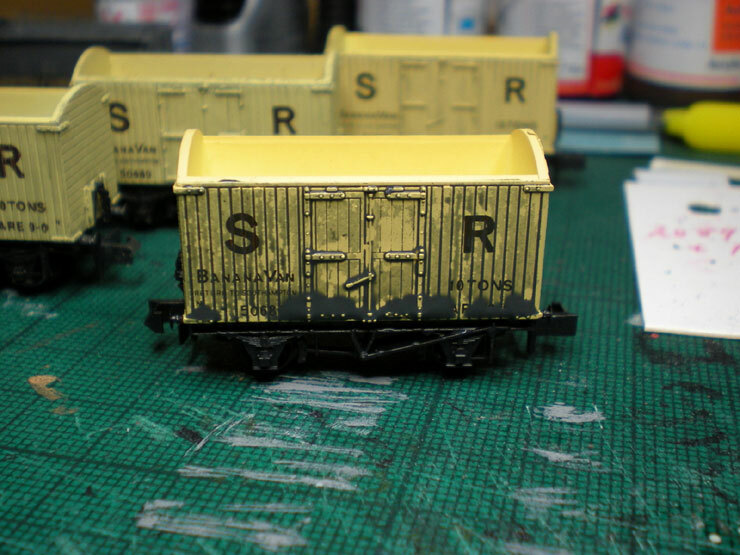 Buffers repainted as always. The finished loco made a visit to an exhibition layout for a photo session (see the Locomotive Gallery for more photos).